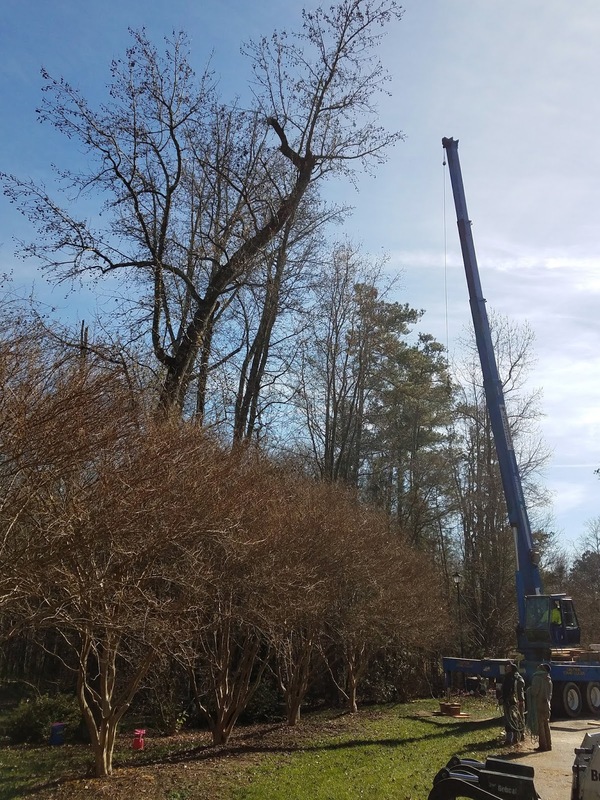 Southern Peony: 2018 More Light for Tree Peonies, Sweet Gum Ball & Poplar Trees Gone! 2018 More Light for Tree Peonies, Sweet Gum Ball & Poplar Trees Gone! I can hardly believe it!!! The sweet gum ball trees are finally gone! 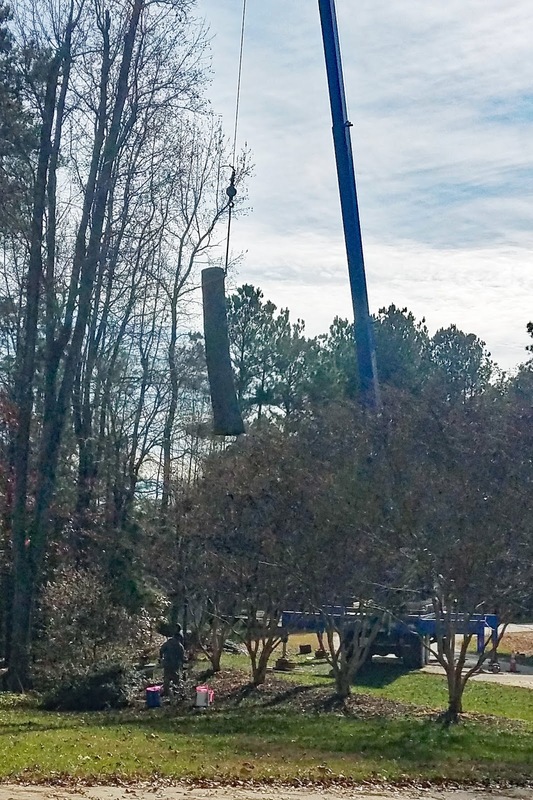 I have been wanting those tree removed for years now! I actually had the money saved up since August, but I couldn't get anyone out here to do the work (since we had two hurricanes this year, most of the tree service companies are staying pretty busy). I finally got one of the guys who brings me free mulch to take the trees out for me. It ended up costing me a bit more, but they did a great job, were really nice, and super professional. At first I was only going to take down 5 trees, then 6, and at the last minute, I went for 7. I'm so glad I did because that last one was a really large sweet gum ball that continuously drops those hateful spiky balls into my yard. If they haven't found a way to stick my fingers or feet, then one of us is slipping on them about to fall down. Besides getting rid of the sweet gum balls (and the potential hazard to our house if they fell over), I now have lots more sun for my peonies, especially my tree peonies. I am so excited to see how they will grow now. I even took some extra time to make sure they were marked and protected before the crew began their work. For the tree peonies directly underneath the sweet gum balls, I covered them with 5 gallon buckets and hammered metal garden stakes into the ground around them to keep them in place. Then I wrapped the tops of the stakes with hot pink flagging tape. Several people told me I'd better dig them up and move them temporarily, but since I decided not to grind the stumps that were very near the tree peonies, I decided not to dig them up. I figured I'd probably damage them more than the tree people would. I guess I got lucky. It seemed to work pretty well. My tree peonies weren't very old yet. So they weren't too big to cover. I guess if they would have been even larger, I would have had to figure out something bigger to cover them with. Luckily they weren't too large, and all of the tree service people were very careful to try not to touch them. 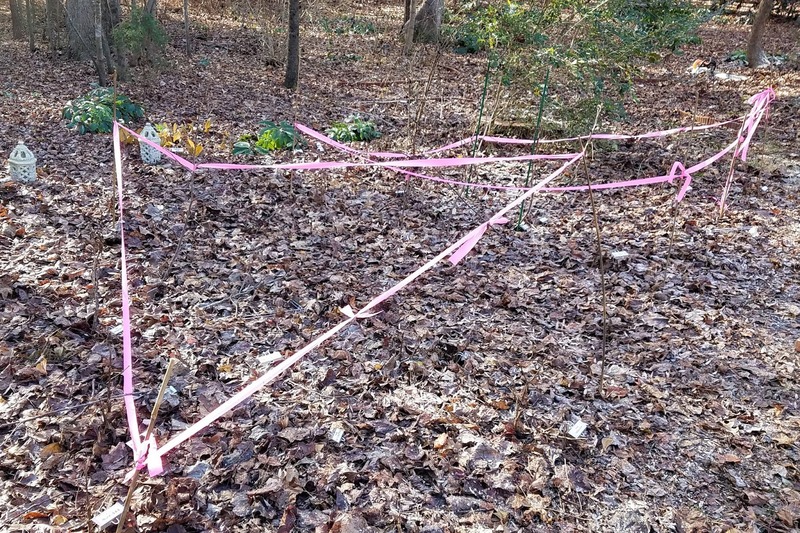 I also roped off my larger tree peony area with stakes and flagging tape to make sure they didn't step in that area. They kept out of it for the most part. I think a couple small twigs might have fallen in, but I don't think I lost any buds. A couple of my plant stakes did get pulled up, but that's not too big a big deal. All in all, I think it was a pretty successful operation, and I'm very excited to see how well everything grows next spring!!! 2018 7 Inches of Snow on Southern Peony Gardens!